Born and raised in Southampton, UK, Monique is a 3rd year BA (Hons) Marketing Student based in London. She is a representative for her course at LSBU the third year running, serves as the Social Media Executive for the Institute of Directors student steering committee, and is an active member of the LSBU netball team. In addition to studying, Monique thrives in her role as Business Operations Specialist at a renowned sports and orthopaedic clinic where she enjoys managing her team and facing thought-provoking challenges daily. She is passionate about expanding her skill set with every opportunity she gets and is excited about what the future holds. A native of London, Maryam is a 3rd year Bachelor of Arts (BA) student studying Business Management with Accounting. Currently, she serves as Course Representative and Enterprise Ambassador at London South Bank University. She has participated in the University Business Challenge (UBC) 2017 and received a social enterprise achievement for empowering education internationally with Wings of Hope (WOHAA). In addition, she has also held an internship position during 2018 with SharpCloud Software. Maryam has a passion for customers, technology, entrepreneurship, and consulting and plans to work in financial consultancy in the future. Syed was born and raised in London. He is a 4thand final year student studying the BA (Hons) Accounting and Finance at London South Bank University. During his 3rd year, Syed completed a one-year placement for Bupa Health Insurance in their Centre Finance Department. During the placement, he was in responsible for collating financial business data in order to prepare well-informed and comprehensive analytical reports. At LSBU, Syed is a Student Ambassador representing the university at numerous internal and external events. Once he graduates, he plans to pursue a career as a financial analyst. Raised in Algeria and now living in London, Adel is a 4th year Business student with a focus on Marketing. He is on path to becoming an entrepreneur after graduation. After a successful second year, Adel had secured and completed a 14-month industrial placement with the International Office at LSBU, assisting prospective international students with maximising their experience at the institution. 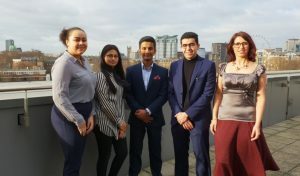 Always up for challenges and being a pioneer, Adel represented LSBU in the University Business Challenge 2017, and reaching the quarter finals in early 2018. Adel is a boxing enthusiast with 6 years’ experience and plans to apply the discipline and hard work ethics he acquired to pursue his dreams and passion for travel by starting a business in summer 2019. Christina is a Lecturer in Economics at London South Bank University. She is the course director for all economics undergraduate courses and the School of Business Lead for International Recruitment and Collaborations. She also manages the School of Business relationship with the Institute of Directors and their student membership scheme at LSBU. Christina is passionate about all things international and her specialisation is in International Finance and Financial Econometrics. Prior to LSBU, she worked as an Economic Analyst in the foreign exchange derivatives market.